At Sanremo, you are all losers winn4rs!! 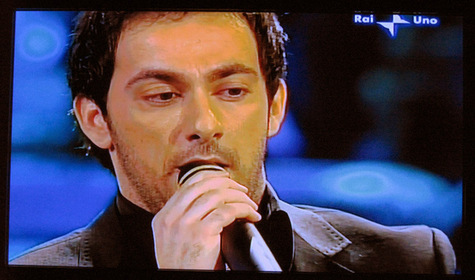 The judgement of the 57th Sanremo Festival has been finalized, and first place was handed to Simone Cristicchi (pictured above) for singing/rapping "ti regalero' una rosa". For those curious, Youtube link here. Piero Mazzocchetti also worked it hard this past week, and won third place for his presentation of "Schiavo d'Amore" (Youtube link here), which was song originally written for Roberto Alagna. And then we heard that, um, whaaaa........zzzzzzzzzzzzz. Imagine dying and going to a place where particularly bad episodes of American Idol are on 24 hours a day, for all eternity. 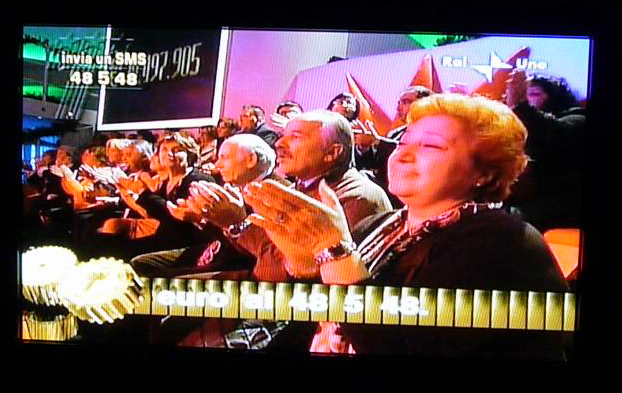 Hell is not other people, Hell is Festival di Sanremo. And I am in Hell. Opera Chic -- so that you don't have to -- is trying to watch as much as she can of the whole sorry singing mess (ie, about 10 minutes a night, but YouTube helps). 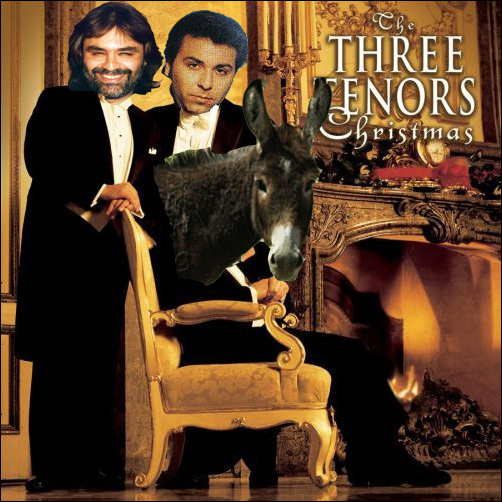 In a nutshell: it's the 30 lamest singers in Italy, fighting each other to the death in a Eurovision-style (actually the formula was born at Sanremo and exported to Eurovision), 5 nights of nightmare. The TV audience at home votes via txt message or whatever. On Saturday night, an especially bad singer wins. Suffice to say that these two dorks, apparently, have a standing chance of winning the Festival -- they're a tuneless, voiceless duo where only one remotely even tries to sing and the other isn't even that cute. Italian teenagers apparently go nuts for the two pimply-faced Roman twentysomethings -- they're emo + Peter Gabriel on a morphine drip, so bad that their record company enlisted Nelly "Sono In Retardo" Furtado to accompany them in a trio that is as ill-advised as it sounds, AND SHE MANAGED TO MAKE THE SONG BETTER. Appropriately, they're named "Zero Assoluto", Absolute Zero. We give them a "0", and get us an Absolut, please (Opera Chic is partial to Grey Goose, but whatevs). Another catastrophically bad specimen we've had to endure is this lady -- a weird, dragqueenerrific Cabaret/Lounge Singer/TripHop act whose only impressive talent seems to be the ability to solicit catty comments (unprintable here) by Opera Chic's friends for her Cirque De Amneris looks and weirdykins unibrow. Tomorrow night, then, the "Finale", and the winners. I'll have to watch. Mazzocchetti is all like, "TOP THAT, ALAGNA!" Opera Chic was busy re-reading Goethe's Götz von Berlichingen (löl ich bin eine löllercoaster löl) when a sms came ringing on her Samsung BlackJack to quickly turn the SKY satellite to Rai Uno. 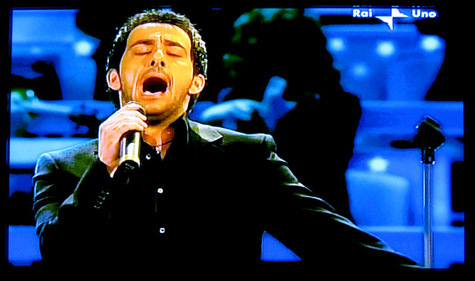 I had tried to forget: The Sanremo Festival had started this evening! 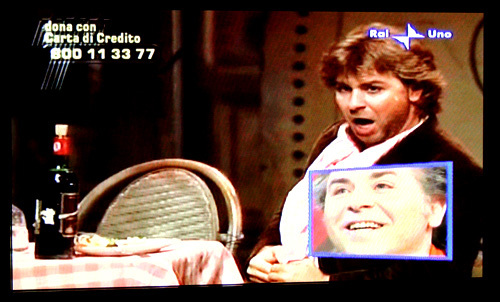 There on the screen, dressed all in black, was the Roberto Alagna Sanremo replacement Mr. Piero Mazzocchetti, belting-out the song that was originally commissioned for the Aida-walk-off tenor to premiere live, "Schiavo d'Amore". 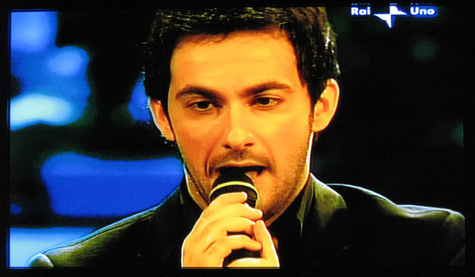 Mazzocchetti, one of the twenty other singers currently crooning lame Italian pop at the 57th Sanremo Festival, deftly premiered the song a little while ago, which was promised to be sung by Alagna before the predictable cancellation on January 7, 2007. 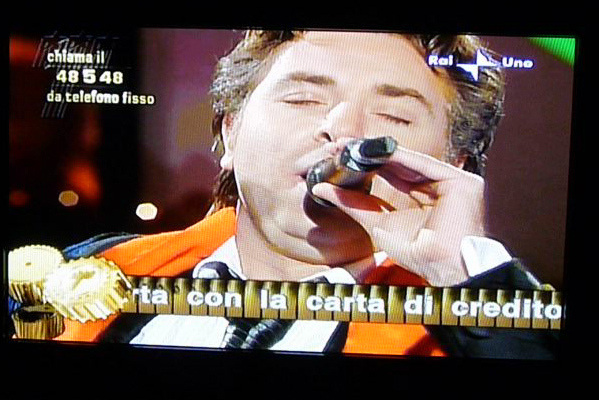 Although many Milanese have wiped their hands of Alagna forever after his Aida walk-off, we all agree that at least Alagna saved his last, dying shred of dignity by cancelling participation in the painfully lame Sanremo. Also, like Shannen Doherty and Paris Hilton before him, one of Mazzocchetti eyes are slowly fighting their way off his face. That is all. BREAKING ALAGNA NEWS! PLEASE CREDIT OPERA CHIC! 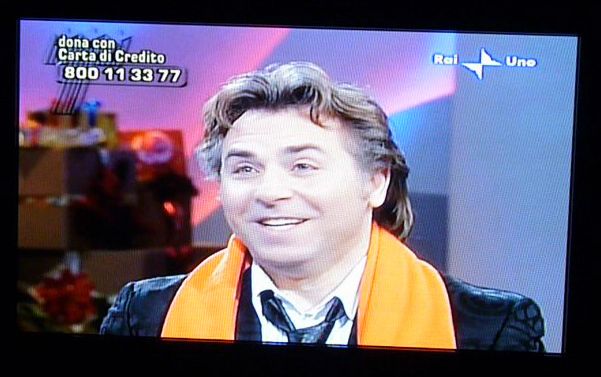 Opera Chic has just learned that Roberto Alagna has bowed-out of his upcoming appearance at the Sanremo festival. 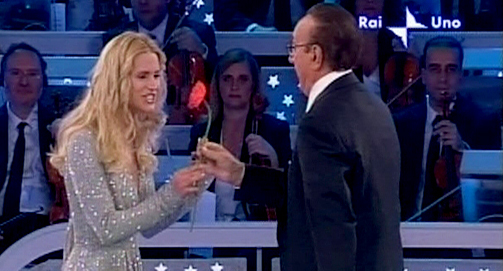 Link here, which is Pippo Baudo's official roll-call for the Sanremo festival, and doesn't mention Alagna. Go on: Control+F for the "A-word". Good luck finding it! In addition to the entire cast/crew of the recent La Scala Aida, Alagna has clearly burned his existing bridges with Pippo "ex-husband of Katia Ricciarelli who beats-up hecklers outside of the opera house" Baudo, Director and M.C. 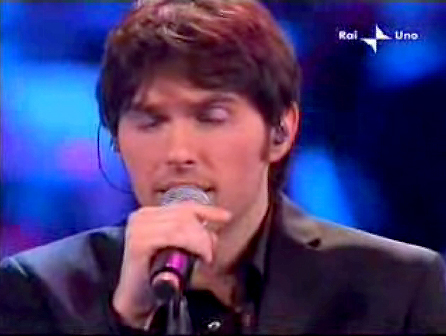 of the entire Sanremo Festival. Alagna has also burned his bridges with songwriters Guido Morra and Maurizio Fabrizio, who specifically wrote Alagna an original song ("Schiavo d'Amore") that he was supposed to live-debut at the festival. The affair comes down purely to scheduling, which Alagna flubbed, and just doesn't have capacity for. 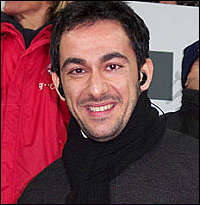 His opening night at the Vienna Staatsoper for Massenet’s Manon is on Saturday, March 3, 2007, which is coincidentally the climax and closing-night of the Sanremo festival. 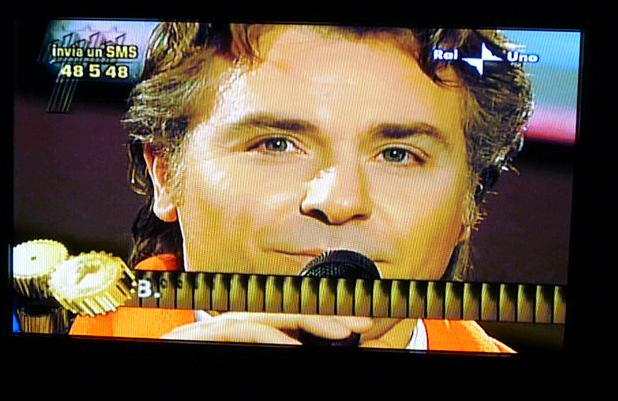 Therefore, the only feasible slot for Alagna's Sanremo appearance would have been on Friday, March 2, 2007, which is designated for all the super-stars. One can only guess that Vienna was all like AW HELL NAW when they realized that Alagna wouldn't be present for the final, general rehearsal the night before their Manon la prima. Can someone gift this boy a filo-fax or something? ALAGNA! What lies are these?! 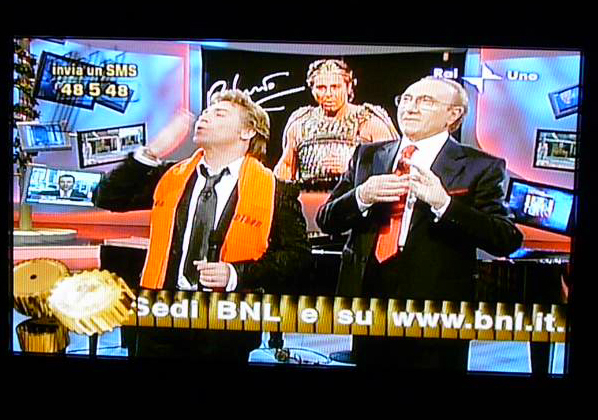 One of the most bizarre moments in the off-the-charts bizarre Roberto Alagna saga, i.e. Alagna's apparent plan to sing a pop song at the horribly lowbrow pop music Sanremo festival will be confirmed in the next few hours, so stay tuned for more breaking news tomorrow. Now, even if you blind yourself to the obvious lameness of the Festival itself -- no rational opera star of Alagna's stature would appear there unless they willfully decide to jump that crossover shark, like, 4evar -- Alagna's problem is that he has, for the same week in March, a slightly more pressing engagement: he's also scheduled to appear at the Wiener Staatsoper for la prima of Massenet’s Manon, as Opera Chic reported here and here. Hmmmm. Tough decision there. 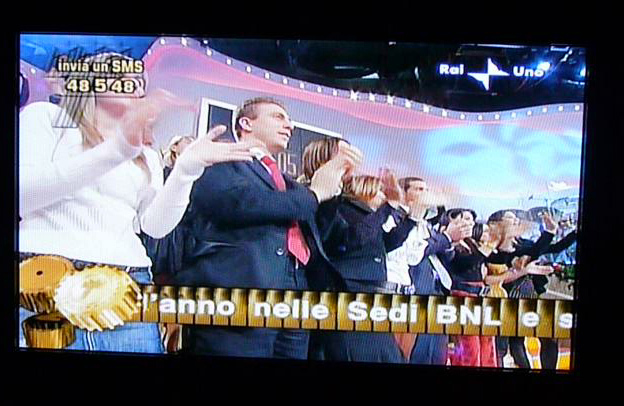 As a "super-star" lol, Alagna would obviously be asked by the Sanremo producers to appear on the super-popular slot for the evening of Saturday, March 3, 2007, live, smack in the middle of prime time. Make sure to visit Opera Chic tomorrow for the answer to these pressing (well, all is relative) questions. 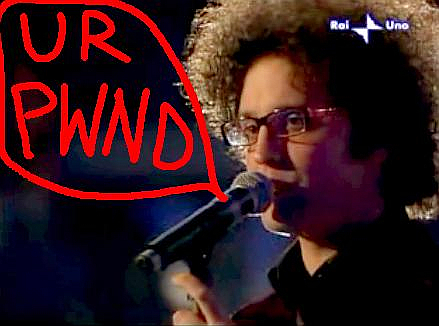 What if they boo him in Sanremo, too? Now that the fiasco at La Scala has left us in the chaotic aftermath of Alagna's hasty decisions, what remains is the mess of scheduling that he will undoubtedly have to cleanse. One of the many diplomatic mistakes that Alagna committed, even before shunning his crew and colleagues at the traditional aperitivo with the media the Saturday afternoon before La Prima (as Opera Chic had previously reported here), is his frankly baffling decision to go to the horribly low-brow pop music festival Sanremo (as Opera Chic previously reported here). What's even more baffling is that even though Pippo Baudo (the super-lame Director/MC of the festival and the ex-husband of Katia Ricciarelli) wanted Alagna to perform in the hottest slot of the festival (which falls on Saturday, March 3, 2007), Alagna's schedule betrays him, and states that he is disposed. 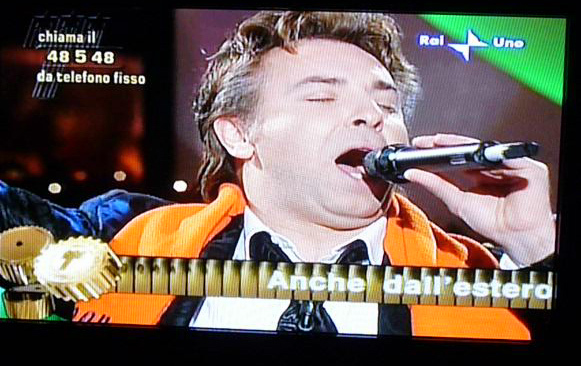 Disappointing for the Sanremo staff, seeing that for the occasion of Alagna agreeing to sing at the festival, two lamer songwriters Guido Morra and Maurizio Fabrizio had agreed to write him an original song, which Alagna promises to sing on the show: "Schiavo d'Amore", (Slave to Love). ewww, lame. Well, that special slot that Alagna has overbooked, happens to be the *same* night that he has committed himself to a slightly more important appointment: Interpreting Chevalier Des Grieux for opening night of at Massenet’s Manon (with Anna Netrebko) at the Wiener Staatsoper. 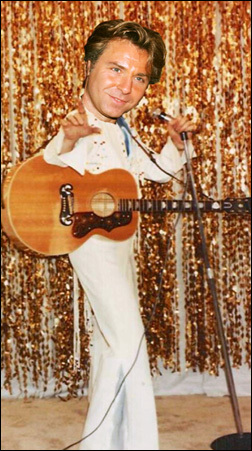 No doubt, Alagna will have to appease both his ego and the Sanremo staff, and graciously decline the huge bonus super-star spotlight on Saturday, March 3, 2007, and instead, defer to an earlier, less-glamorous appearance Thursday or Friday. Regardless, I can’t imagine that the Vienna State Opera management will be pleased with the tenor’s decision to be in transit the night before he is to be singing at opening night: flying back and forth from Vienna to Italy and then having to be driven to the small, airport-lacking Italian-town close to the French border? 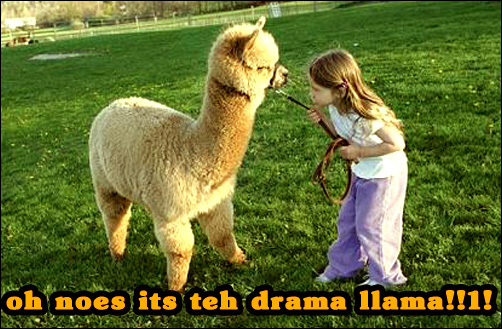 To you, Opera Chic readers, the answer.